Yesterday I posted a list of music-centered movies that were some of my favorites and which I thought everyone should see at least once. While I will undoubtedly be adding to the list, I thought it would be a good idea to go into each one a little deeper and explain why I love it so much. As a lot of these flicks have inside jokes all the way through, I’m excited to point out just why some of them are so funny. 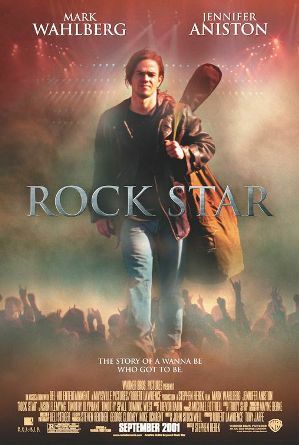 Up first, the incredibly underrated movie Rock Star (2001), starring Mark Wahlberg and Jennifer Aniston, among other recognizable names. While I quite like Wahlberg’s performance and Aniston is good as always (and is it just me, or does she just seem to be in everything? ), one of the coolest things about this film is the laundry list of actual rockstars that are in it: Jason Bonham (Led Zeppelin/UFO/Foreigner), Zakk Wylde (Ozzy Osbourne/Black Label Society), Jeff Pilson (Dokken), and Stephen Jenkins (Third Eye Blind). Frankly I’d watch it just to see those people in the cast. (And I promise not to give away anything that’s not in the promotional trailer). The plot itself is a nod to the real-life story of Tim “Ripper” Owens, a Judas Priest fan who ascended to become the new singer of Priest when Rob Halford left to explore his solo project (1996-2003). The movie mirrors Owens’ life so closely, in fact, that the beginning of the film finds Chris “Izzy” Cole (Wahlberg) as the singer of Blood Pollution, a Steel Dragon tribute band (in real life, Owens was the lead singer of British Steel, a Judas Priest tribute band). (Though his part is minor, it’s still really awesome to see Jenkins play the rival singer from the other Steel Dragon tribute band). With his business manager/girlfriend Emily (Aniston) by his side, Cole gets kicked out of his band amid internal conflicts, only to find himself in an audition for the real Steel Dragon following the departure of their original singer. While Cole explores the trappings and excesses of the late 1980’s hair metal scene in L.A., he soon finds that his Steel Dragon bandmates (played by Bonham, Pilson, and Wylde) don’t exactly view him as an equal, stunting his artistic (and personal) growth. It’s not long before Cole is consumed by the excess and decadence of the glam metal scene, and Emily voices a desire to leave and open a business with her roommate in Seattle (foreshadowing anyone??). I won’t give too much away, but I will say that the end of the film is a clear nod to the death of the glam metal scene, and the rise of grunge. Without describing too much, pay close attention to Cole’s dress towards the end, and see if he reminds you of anyone (if you’re a music history fan, you should figure it out in about ten seconds). All in all, Rock Star is just one of my favorite music movies because it’s got a good, simple message, and it’s entertaining to watch. The laundry list of real rockstars in it would give any music addict aneurysms, and the history that’s commented on beneath the surface is pretty cool to see. Not a blockbuster, but still a great film in my opinion.